Usually a quaint town, Auburn, Alabama bursts at its seams seven weekends a year and warmly welcomes football fans from around the world to cheer on the Tigers in Jordan Hare stadium. From what to bring, to where to be and how to dress, we share 5 essentials to having a perfect gameday on the Plains. Auburn is a family-friendly tailgating spot. Tent and tailgates of all shapes and sizes dot the campus, as people rope off premium spots starting Friday before games. No tent, no problem. Auburn’s large student center, across from the football stadium, welcomes those without a home; offering lots of seating, clean bathrooms and dozens of food options. Ahhhh, tailgate food. Good food makes good times and happy people. 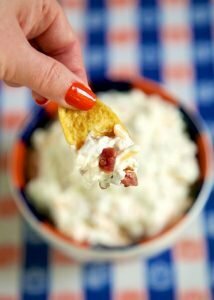 Simple and easy tailgate recipes are a must! Here are two of The Collegiate Hotel staffs’ go-to-tailgate recipes that are fast and easy but with plenty of style. Creamy and addictive this dip is best served cold or warm! Pair with tortilla/Frito chips or veggies. Throw it on a burger for an interesting combo! before or the morning of the game. 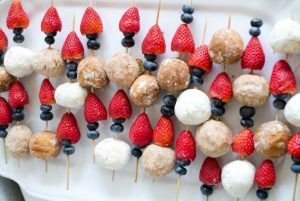 Get your full serving of fruit and a donut to boot! Did someone say pregame cocktail? Keep tailgate bartending a low-stress affair by planning ahead. The Bar at Wittel team suggests an easy make-ahead tailgate cocktail, the War Eagle Rum Punch. This rum infused punch is a simple yet delicious drink. Mix your OJ and rum the night before (even freeze for those hot games) and just top everyone’s glasses off with Sprite at the tailgate for a quick and easy cocktail. Before game day festivities begin, head to the bookstore to gear up for the big game. From family to university-owned, there is no shortage of bookstores to collect a one-of-a-kind gameday button and grab an Auburn shaker (a much-needed accessory). Be sure to wear Auburn’s official colors, orange and blue, to cheer on the Tigers! Auburn loves its traditions and Tiger Walk is a gameday must! Fans begin arriving 3 hours prior to game time to cheer the football team as they walk from the Athletics Complex at Samford Ave. down Donahue Drive to Jordan-Hare Stadium. Get a front row spot and join thousands of fans as they take pictures, high-five favorite players and coaches, say “Hey” to Aubie and get your jersey autographed. The Tiger Walk begins two hours before each game and is one of Auburn’s most deeply rooted traditions! At the intersection of College Street and Magnolia Avenue is where all football fans hope to gather and celebrate one of Auburn University’s most iconic traditions, rolling the sacred Toomer’s Corner oak trees. Only a short walk from the stadium and The Collegiate Hotel, grab some toilet paper and join the Auburn family in celebration. Be sure to grab a famous handmade Toomer’s Lemonade after you’re done rolling! 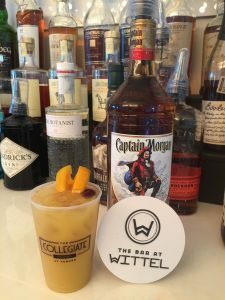 After a good roll of Toomer’s Corner join the team at The Collegiate Hotel and finish off the night on a high note at the Hotel’s Rooftop bar, The Bar at Wittel. 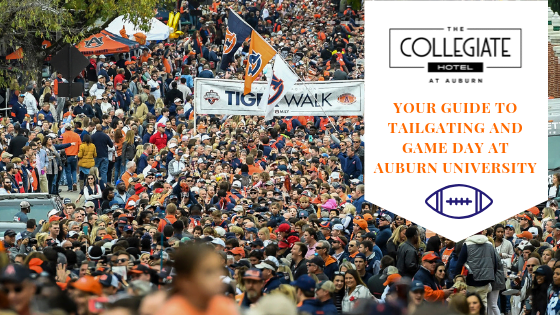 Enjoy a handcrafted signature cocktail with an orange and blue Auburn sunset and look forward to doing it all over again next Saturday! Whether its game day or any day, our Auburn, AL hotel is one of the best places to stay in the city.